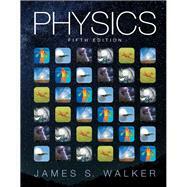 James Walker’s Physics provides students with a solid conceptual understanding of physics that can be expressed quantitatively and applied to the world around them. Instructors and students praise Walker’s Physics for its friendly voice, the author’s talent for making complex concepts understandable, an inviting art program, and the range of excellent homework problems and example-types that provide guidance with problem solving. The Fifth Edition includes new “just-in-time” learning aids such as “Big Ideas” to quickly orient students to the overarching principles of each chapter, new Real-World Physics and Biological applications, and a wealth of problem-solving support features to coach students through the process of applying logic and reasoning to problem solving.The Fifth Edition is accompanied by MasteringPhysics, the leading online homework, tutorial, and assessment system.